Myth-1: Cardio, cardio, and only cardio is the ticket to quick weight loss. Fact: Spending hours on the treadmill is a sure-fire way to lose weight right? Well, yes. You do lose weight faster with only cardio, but you also lose muscle along with the fat. For a long lasting change you should also include strength workouts in your routine. Strength training helps to build lean muscle mass, boosts metabolism, and helps you burn more fat even when you are not exercising. Myth-2: If you don’t commit to do an hour of cardio, it’s not worth it. Fact: This is an absolutely false statement. According to the American heart association a 20-minute high intensity workout session like running is as good as 30-minute moderate intensity session like brisk walking. In fact, according to a recent study, short and frequent sessions of slow running were found to be good for the heart. So no more “I don’t have time” excuses to be given! Myth-3: Doing cardio workouts on an empty stomach makes you burn more body fat. Fact: This one comes from the theory that if your body doesn’t have easily available food calories, it will use the body’s stored supply. However, this is not true. In a meta-analysis done in 2011 it was found that fat burn was consistent and it happened regardless of whether a person had eaten or not before a workout. Another research showed a negative effect on muscle loss in people who skipped their pre-workout snack. Your body needs some amount of energy to perform and that energy comes from food. However make sure you don’t gorge on a lot of food. A small snack is enough to help you perform well. Myth-4: It is imperative for you to stay in the “fat-burning zone” if you want to burn fat. Fact: Like a lot of other fitness myths, this one is also half true. While it is true that a lower intensity workout will help you burn more calories from fat, what really counts is the total calories burned. That is what matters most for weight loss. So, if you are looking at losing pounds, a higher intensity workout may be a better option. 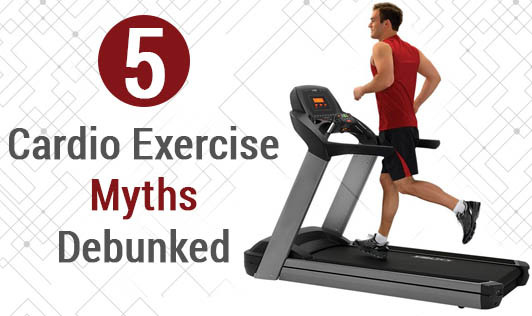 Myth-5: If you go for a bike ride or a run, you can skip on legs and strength workout. Fact: Unless you are running uphill or really pushing hard on the pedals, you aren’t really getting muscle-building benefits from your workout. So even though you feel like your legs did some work to gain muscles in reality you have not, in order to really make your legs strong, you need to incorporate strength-training exercises like squats and lunges in your exercise regime.